If you want pretty gauges and technical information about your car's performance on your dashboard, DashCommand may be the app for you. It is AppRadio compatible and works well with the in-dash receiver. The iOS app has been updated to version 3.0.0 today with quite a few new features and improvements. The app uses your car's OBD-II port to pull data. So what's new in version 3.0.0? Here's a complete list from the app's details. As you can see above, most of the fixes aim at making trip logging values more accurate. They are mostly calculation improvements. But the biggest one for me is the auto-connect system. Hopefully with this latest update the iPhone will automatically connect to the OBD-II device over the ad hoc wireless connection, something that had to be done manually up until now. The app has also added compatibility with the new iPad and has been improved to run better on dual-core devices like the iPhone 4 and 4S. I haven't tested out the update yet but will do so soon and report back. You can download DashCommand version 3.0.0 from the App Store today. Version 3.0.0 was made available for Android on April 25, 2012. So probably the improvements for the iOS app were already available through Android. 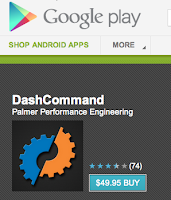 You can download DashCommand for Android from Google Play today.